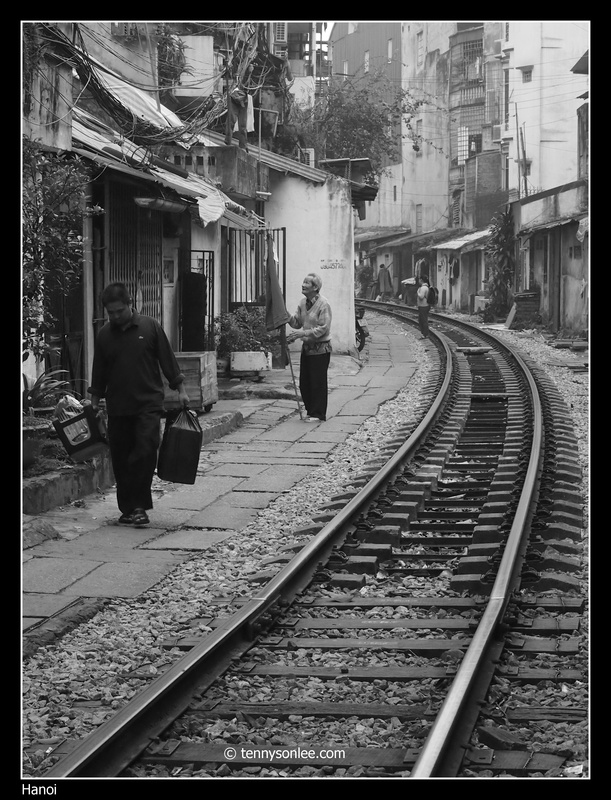 Old Quarter is the key attraction in Hanoi. Let’s me share the following snapshots to illustrate scenes that were not common in Malaysia. Notice how close were the houses built along the railway. The track separate Old Quarter from Citadel and newer part of the city. Malaysian embassy is just a short walk from here. There were plenty of luxury cars on the road. Traffic light and no-entry sign were useless in this part of the town. See how daring the lady stopped in the middle of the chaotic junction to talk on the phone (without helmet)? I purposely use the Diorama effect to over saturate and collapsed the traffic to give it a funny look. Below is another interesting picture to capture a brave foreign tourist, she was taking snapshot while riding the bicycle. 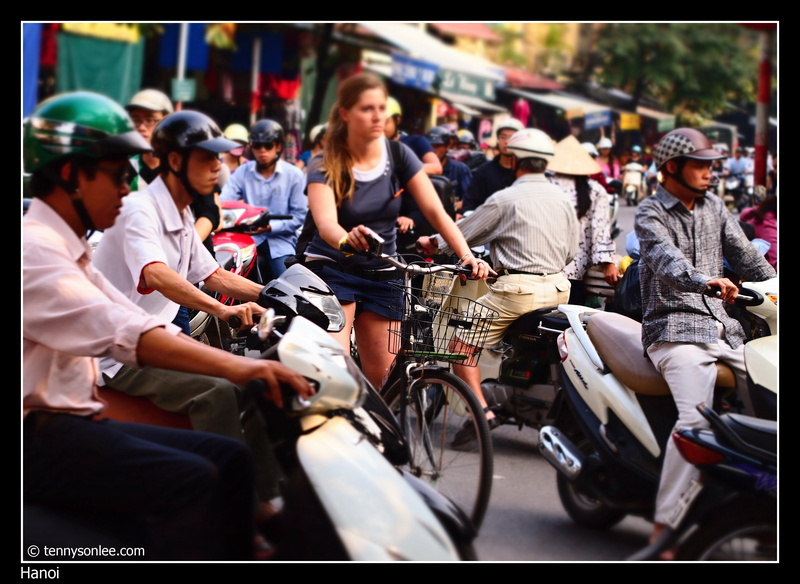 Vietnam is one country where you can see “artful” driving skills criss crossing each other with little or no collision. 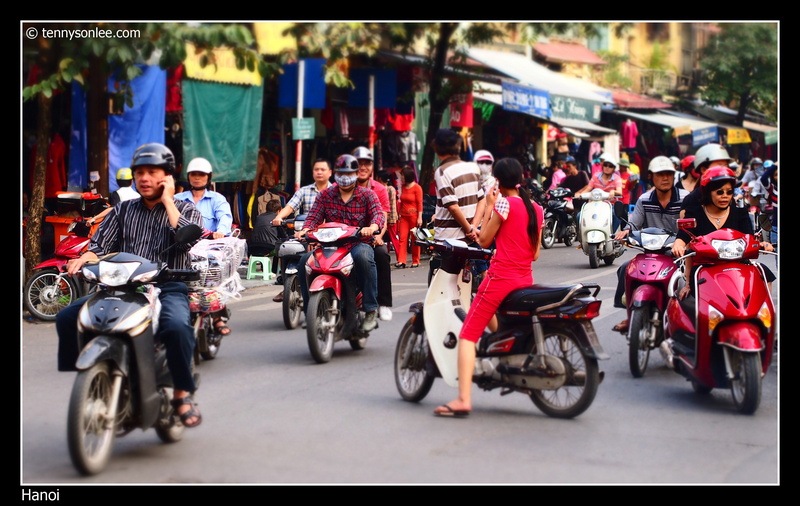 The pedestrian walkways are also chaotic, filled with parked motorbikes. 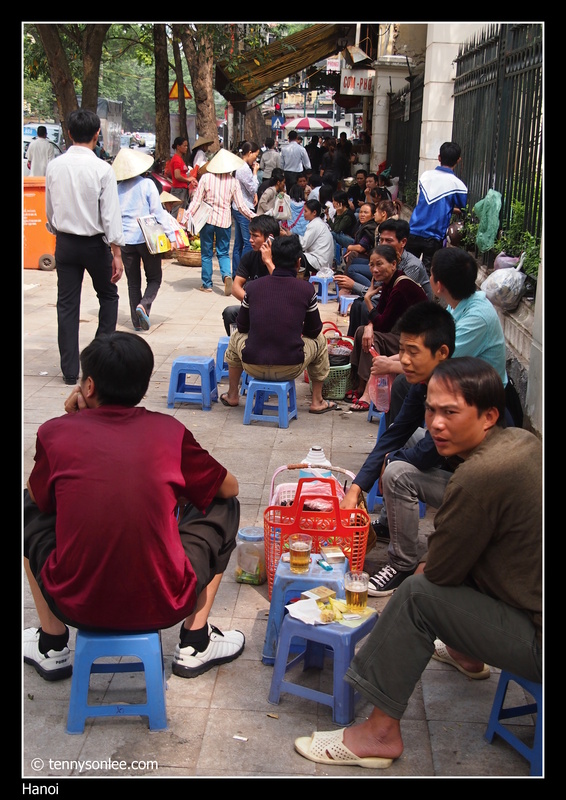 Any remaining space were often taken up by food hawkers, or people playing chess. The short-legged stool could serve as a chair as well as table to place food and drink. I could see interesting subjects and actions on every turn. 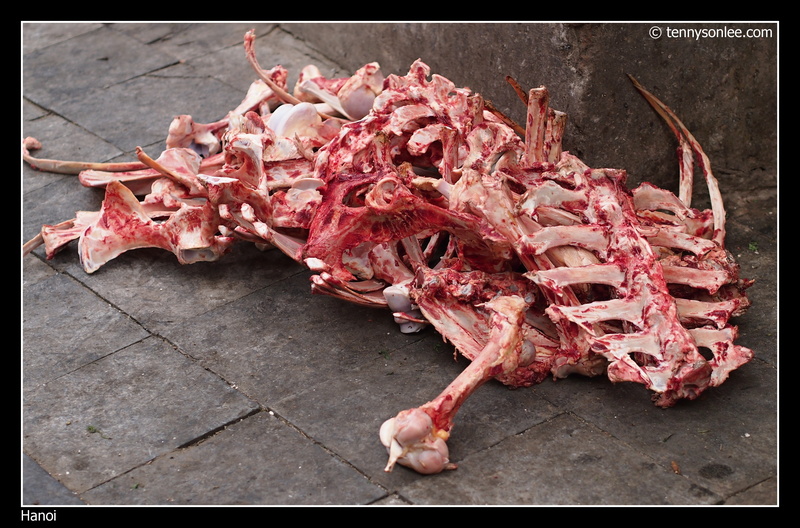 I found these bones on one of the main streets next to telecom equipment. Interesting enough, I bought a pair of chop sticks made of cow’s bone. 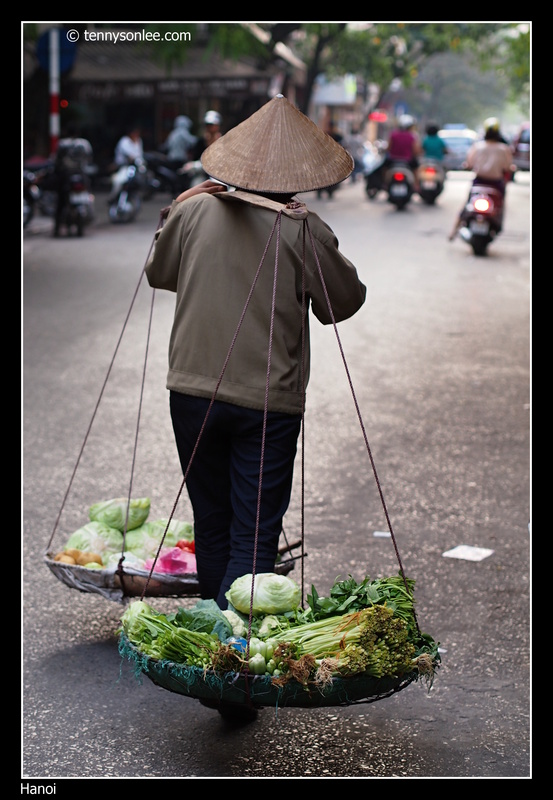 There were plenty of hawkers carrying basket with a pole on their shoulder. If they pursue you to try to carry the baskets to take a picture, you better decline the offer, else you will have to buy something from them at premium price. There were plenty of petty scam like this at Hanoi. We took a taxi running on meter but realized that the meter ran faster than usual. 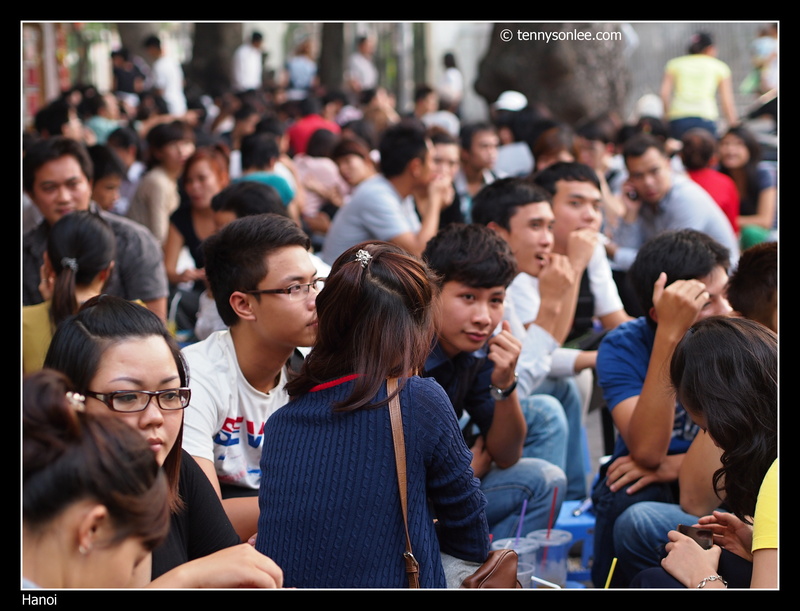 The hotel manager later informed us that we could avoid this by taking more trust worthy brand like the “Taxi Group”. This entry was posted on November 1, 2011 by Tennyson. 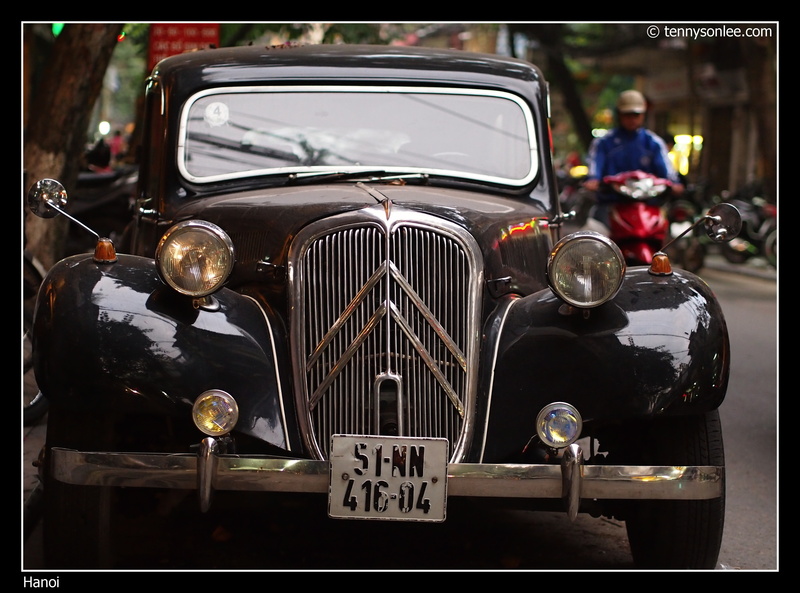 It was filed under Hanoi, People and Portrait, Places, Street, Vietnam .